G’day mates! Several of us at GU have just returned to the states after 5 days in beautiful Melbourne Australia attending the International Consortium for Intergenerational Programmes (ICIP) 2006 conference. 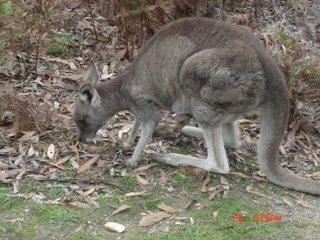 It was a terrific event that got us more excited than kangaroo s up a tree! First off I am honored to have be en elected and to serve as the ICIP Chair for the next four years. I know that everyone on the ICIP management committee looks forward to setting an agenda that will continue to strengthen the international presence of intergenerational programs. Of course we can’t do it with you. Please visit ICIP online at (www.icip.cswebsites.org/default.aspx) to download the latest newsletter, learn about upcoming global, regional, and national conferences, and show your support by becoming a member and sharing articles in future newsletters . Thanks to the conference sponsors , in particular Susan Feldman for her outstanding leadership, and those who volunteered their time to make this event go so well. I also want to express my gratitude to everyone who presented and attended the conference , especially those that traveled from all over the globe to be there. I’m proud to report that we had representatives from a dozen nations. Each country brought their unique approach to developing and sustaining intergenerational programs. What is happening where you live? Is there a program that builds bridges between cultures or across borders? Tell me about it!